Deaf Team's Standout Season Draws Cheers It's not until the team huddles that you notice anything different about Gallaudet University's Lady Bison. The university is the premier school for deaf students. Its basketball team competes against mainstream — hearing — teams, and this year, it's making a surprise run up the national rankings. Gallaudet University's Lady Bison come with the same hoopla as any other college basketball team: Cheerleaders rustle fistfuls of pom-poms; wild male fans in nothing but face paint and brightly colored Speedos rile up the crowd; and frustrated coaches lob high-pitched advice from the bench. It's not until the team huddles that you notice anything different about the Lady Bison. All the Gallaudet players are deaf or hard of hearing. The university, located in Washington, D.C., is the premier school for deaf students. Its women's basketball team competes against mainstream — hearing — teams, and this year, it's making a surprise run up the national rankings. How Do You Play Basketball If You Can't Hear? Playing basketball would seem to require at least some hearing — for whistles, buzzers or the sounds of the ball. But the players say it's not as important as you might think. "We've been playing around 23 games," guard Stephanie Weiss says, "so I feel like we know each other. We're sisters for life — like, we know how to communicate with each other." Rookie guard Britny Latham says she looks for visual clues. "I watch to see if anyone stops or throws their hands up," she says. "I just watch, or I can feel the beat on the ground." Obviously, it works; Latham is a breakout star in a standout season on a team that's nationally ranked — and a favorite for an NCAA tournament bid. 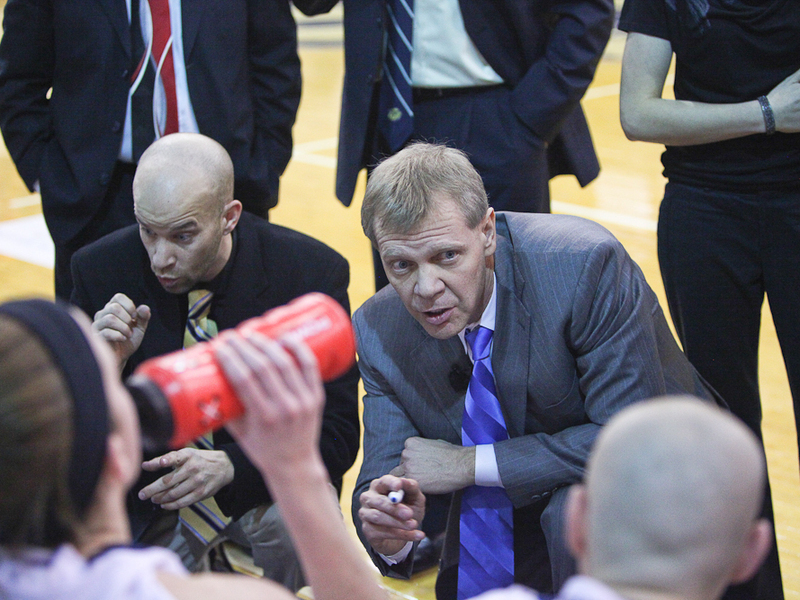 Kevin Cook (right) coaches his players with assistance from interpreter Chris Bahl (left) during a game. During games, coach Kevin Cook scribbles plays on a dry-erase board while his assistant coaches back up his instructions in American Sign Language. Cook is a former WNBA coach who was working with a team in Nigeria when he left to take the job at Gallaudet. He didn't know sign language when he joined the program, but says he and his players communicate just fine. "I think my signing is a little better than I'm given credit for," he says. "The team follows me and the message that I try to get across. I can get through practice, individual meetings with players. When I struggle is in games and when I need to go a little quicker. You know, I'm from Texas, so I don't sign as fast." His coaching style changed after he started signing, he says. He became more patient. "Basketball is basketball, whether you're coaching a hearing team or a team that's deaf," he says. "But you tend to be a little more patient, because it takes you longer to get it out. And for me, especially, it takes longer to get the point across, so I don't boil as quickly as I might with a hearing group." Guard Andrea Amati came to the team in Cook's second year and says his sign language has really improved. "I was a little bit worried with the game of basketball being so quick. I was wondering if he could sign and keep up, but he's very fluent," she says. "Plus, he has the interpreter to help him." As exciting as their year is, Cook and some of the Bison have had some rocky times lately. Cook's sister Kelly recently died in a house fire. Senior Nukeitra Hayes also lost her brother in a house fire. Cook says the team has been a comfort. "We've been able to encourage each other, and the team has been very encouraging to me," the coach says. "Your listeners can't see that my left side shakes from time to time, and that's because I've got a prognosis of Parkinson's. But again, the team has helped me through that. Even when I'm using both hands to sign." 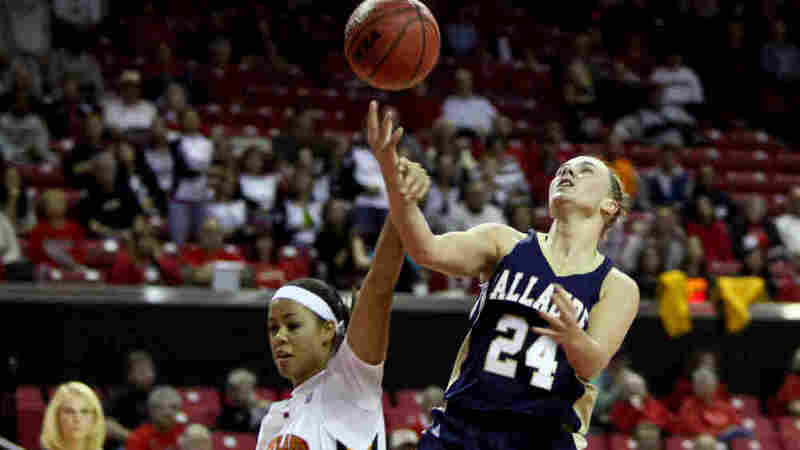 Women's basketball has been around at Gallaudet since 1896, but this is the longest winning streak. That makes the wins all the sweeter, Weiss says. "This is a deaf school, but we have an awesome basketball team. You should come and watch. Find our stats online," she laughs.